Did you know that people with disabilities are the nation’s largest minority? Last summer, I had the opportunity to work with only a small portion of this minority. I worked in the kitchen at Paul Newman’s camp, Roundup River Ranch out in Gypsum, Colorado. Roundup is a camp designed for children with life-threatening and chronic diseases; specifically, I had the opportunity to feed children with cerebral palsy, neurological disorders, down syndrome, cranial disorders, along with cancers, liver transplants, heart transplants, and kidney disease…to name a few. We all know that there is a much, much bigger variety of disabilities than what I just mentioned, and it’s important to spread the awareness of what else is out there. By the way, each disability is so unique and beautiful. When I was at camp, we did this thing called candle chat each night. Candle chat is basically bedroom chat before lights out. Some of the questions asked might be silly like, “If you could have any superpower, what would you have?” or “If you had to go for the rest of your life eating only one thing, what would it be?” Then sometimes, there are more serious questions. The question and answer that really moved me (and actually made me a bit emotional) was, “What or who are you proud of?” A young boy raised his hand and answered, “I’m really proud of all of us for being here at this camp. Even with all of our issues that we have, we are still perfect, and I’m just really happy that we can be here and can grow together.” That little boy’s response completely opened up my eyes even more than I could imagine. Each and every disability makes the world so diverse, and that is a beautiful thing! Now, I’ve worked nutritionally with people who have special needs and disabilities before, but I was never the one who was physically making every meal and snack that the person would be eating. The nutritional aspect for someone with a disability becomes so much more individualized than someone without disabilities. This is what really made my passion for nutrition blossom; the specific needs that the body requires through nutrition are what fascinate me most. As someone who is going to be a future dietitian, it was almost hypocritical to be baking huge cakes and desserts for the campers after lunch and dinner every day; however, I saw how much it was being enjoyed. Food is meant to be enjoyed! —but in the correct portion size and in moderation. It’s important to be aware of how much you are consuming. People with disabilities are nearly twice as likely to be obese as the general population. That being said, it’s extremely important to understand serving sizes and to only enjoy “cheat” foods every now and then. Start with a small serving of something. If you are still hungry, you can enjoy another serving. Don’t skip meals! – Sometimes when we do this, we get extremely hungry and tend to overeat! Once again, enjoy your food!—just in smaller portions and moderation so that we can manager our weight and avoid preventable diseases. 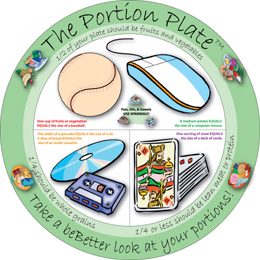 What other tips have helped you control your portion sizes? You can check out more health tips and eating plans on www.eatright.org and www.choosemyplate.gov. I grew up in a small town in Eastern Ohio and then went on to do my undergrad at The University of Kentucky (GO CATS!) where I earned my BS in Dietetics. I am now currently in the dietetic internship program and the Masters of Public Health program at Samford University. As I am rounding out the end of my program and will soon be a registered dietitian, I look forward to opportunities that promote healthy and active lifestyles. My ultimate dream would be to work with children who have special needs, as I have enjoyed previous experiences in these settings. I also love to be around sports, children, food, the outdoors, and family -- oh, and of course, my two kids (aka dogs) Lizzy and Lucy.